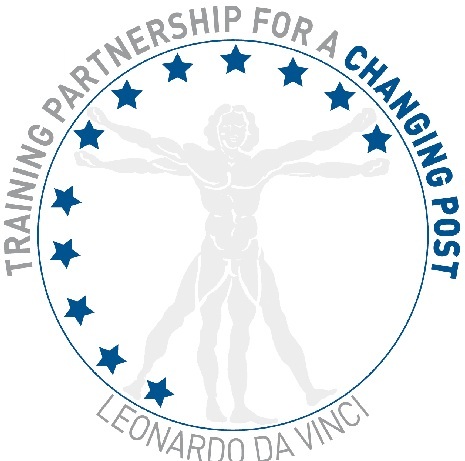 Under the PostEurop Corporate Social Responsibility Activities (CSR-C), the training working group, in cooperation with PostEurop, applied for the European Commission Life Long Learning programme “Leonardo da Vinci” in the year 2010, particularly “Training Partnership for a Changing Post – Project”. The Project duration was 2 years and ended in July 2012. The partnership objective was to create an efficient and innovative training Expert Network to anticipate competences for now and for the future for the crucial and critical positions and jobs in the postal sector. The actions were to share best practices, to promote initiatives in the area of training to anticipate needs, to promote skills development in a sector in permanent evolution with an important workforce. The Project was coordinated by La Poste, France and partners included: PostEurop (expert in Project Management), Bulgarian Posts, Hrvatska Posta, Deutsche Post, Correos y Telégrafos and Turkish PTT. The observers are Magyar Posta, CTT - Correios de Portugal and Swiss Post. The beneficiaries of the programme were the Training and Human Resources experts, the trainees and the top management of those postal operators.